Gilles Villeneuve celebrated his first victory in Formula 1 before a home crowd at the Canadian Grand Prix in Montreal on October 8, 1978. The 1978 season saw a succession of retirements for Villeneuve, often after problems with the new Michelin radial tyres. Early in the season, he started on the front row at the United States Grand Prix West, but crashed out of the lead on lap 39. Despite calls in the Italian press for him to be replaced, Ferrari persisted with him. Towards the end of the season, Villeneuve's results improved. He finished second on the road at the Italian Grand Prix, although he was penalised a minute for jumping the start, and ran second at the United States Grand Prix before his engine failed. Finally at the season-ending Canadian Grand Prix, Villeneuve scored his first Grand Prix win. The Canadian Grand Prix has been part of the Formula One World Championship since 1967. It was first staged at Mosport Park in Bowmanville, Ontario as a sports car event before it alternated between Mosport and Circuit Mont-Tremblant, Quebec after Formula One took over the event. After 1971, safety concerns led to the Grand Prix moving permanently to Mosport. 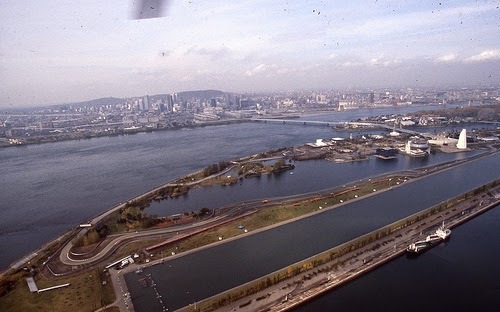 In 1978, after similar safety concerns with Mosport, the Canadian Grand Prix moved to its current home on Île Notre-Dame in Montreal. 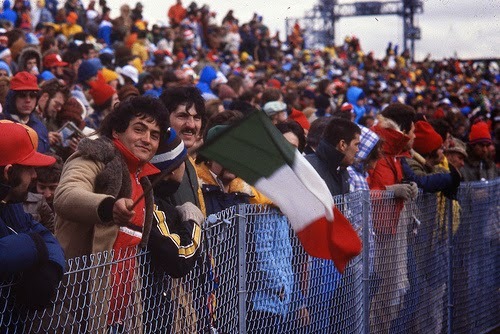 Before the race, in pre-race interviews Mario Andretti noted that he thought that the circuit has been designed in favour of Gilles Villeneuve, a comment that was picked up by local press. Andretti responded to the comments on race day morning, stating that he is "not critical of the race organizers", but instead "critical of our own FOCA officials who were sent over here to approve the track". Poor weather and rain on Friday morning meant that the first practice session began 20 minutes later than scheduled. When the session did start, the two Ferrari drivers were fastest, Carlos Reutemann fastest with a lap of 2:02.600, ahead of team-mate Villeneuve. The second practice session held on Friday was in damp weather conditions as the track dried, with Reutemann again fastest, with a lap of 1:57.900. Wet weather greeted the teams again on Saturday morning for a 90 minute practice session, although conditions got better towards the end of that session, allowing Lauda to go fastest with a time of 1:51.700, Keke Rosberg, Andretti and Watson completing the top four. The entry of 28 cars had to be trimmed to 22 before the race, and those who failed to qualify were, unusually, from six different teams. They were Clay Regazzoni of Shadow, Beppe Gabbiani of Surtees, Arturo Merzario in the car bearing his name, Hector Rebaque in a privately run Lotus, Rolf Stommelen of Arrows and Michael Bleekemolen of ATS. 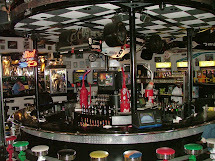 The top ten was just as interesting as the bottom six, as eight different cars were featured. Jacques Laffite was the lowest ranked of these, putting his Ligier 10th. World champion Andretti was also off the pace for Lotus, qualifying 9th. Hans Joachim Stuck drove very well to put the other Shadow 8th, beating his more decorated team mate Regazzoni by over two and a half seconds. Brabham, one of only two teams to have two cars in the top 10 (the other was Lotus), had Watson and Lauda 4th and 7th. They were split by Alan Jones's Williams, a sign of continuing improvement for the team and their Australian driver, who had finished 2nd the last time out at Watkins Glen, and Emerson Fittipaldi, who dragged the uncompetitive Copersucar up to 6th. Home favourite Villeneuve put the Ferrari 3rd, a good performance from the Canadian who had been outperformed by team mate Reutemann all season. He was beaten to 2nd by Jody Scheckter of Wolf, who had also been improving of late. However, pole was a surprise. Jean-Pierre Jarier, who had fallen out of favour with ATS earlier in the season and been dropped in favour of drivers such as Alberto Colombo, Hans Binder and Harald Ertl, had last been semi-competitive with Shadow back in 1975 and had been drafted in by Lotus to replace Ronnie Peterson after his tragic death at Monza two races previous, took pole by just 0.011 seconds from Scheckter. This was no surprise after the Frenchman had set the fastest race lap in his first appearance for the team at Watkins Glen, but was classified 15th due to running out of fuel when in 3rd place. The race started with Jarier in the lead, but Jones had a magnificent start, jumping up from 5th to 2nd. This meant that Scheckter dropped to 3rd, Villeneuve to 4th and Watson down to 5th. Andretti had jumped up past Lauda and Stuck and was holding 6th. Fittipaldi was a casualty on the first lap, sliding off the track into the mud and retiring. Stuck joined him at the same spot a lap later. There was more drama in the race on lap 6, particularly for the Brabham team. First, Lauda had a brake failure and was out. Shortly afterwards, Andretti attempted to pass Watson in the other Brabham, and the two made contact, dropping almost right to the back of the field. This allowed Patrick Depailler up to 5th and Reutemann in the other Ferrari into 6th. Three laps later, Watson had an accident of his own, and was out for good. The next retirement was on lap 17, when Bobby Rahal in the second Wolf suffered fuel injection problems and reduced the field to 17 runners. Jarier had opened up a lead of 20 seconds at this point, as Jones in second was holding up the faster cars of Scheckter and Villeneuve behind him. However, on lap 18 Scheckter found a way past, and Villeneuve followed him through a lap later. At the same time, Depailler was dropping down the order with technical issues, allowing Reutemann into 5th and Derek Daly in the Ensign up to 6th. Daly was passed by Riccardo Patrese not long afterwards. A good few laps ensued for Ferrari, as the very fast Villeneuve fought his way past Scheckter, who everyone knew was to be his team mate at Ferrari in 1979, for 2nd on lap 25. On lap 27, current team mate Reutemann battled past the slow Jones into fourth. Jones also slipped behind Patrese two laps later. Daly moved back up to 6th on lap 33 when Jones dropped back even further with his own technical problems, but the Irishman was under severe pressure from Didier Pironi in the other Tyrrell. 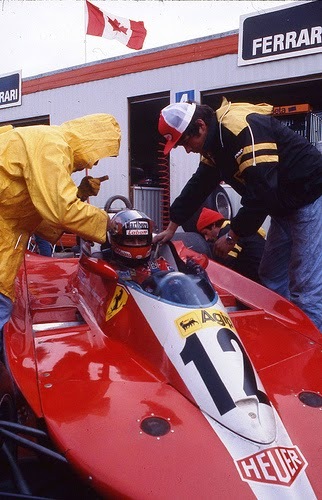 Lap 38 saw another retirement, that of René Arnoux in the Surtees with oil pressure difficulties. The recovering Depailler fought his way past first team mate Pironi and then Derek Daly to take back 6th place on laps 47 and 48, just when trouble was beginning for fellow Frenchman Jean-Pierre Jarier, leading the race for Lotus, which first became apparent when Jacques Laffite was able to unlap himself in the Ligier. Three laps later, Jarier was out with no oil pressure. This was tragic for the Frenchman, who was looking certain to take his first victory, but fantastic for the Canadian fans, whose hero Villeneuve now looked set to take his. This allowed Daly back into the points in 6th. 1976 World Champion James Hunt crashed out two laps later, an unhappy end to his last race for McLaren, with whom he had had so much success, as it was known that the following year he would move to Wolf to replace Scheckter. He was followed out of the race by Laffite's Ligier a lap later, who had transmission problems. From then on, the order did not change, and Villeneuve came home to take his first Grand Prix victory in front of his own fans. Villeneuve was killed in 1982 on his final qualifying lap for the Belgian Grand Prix. 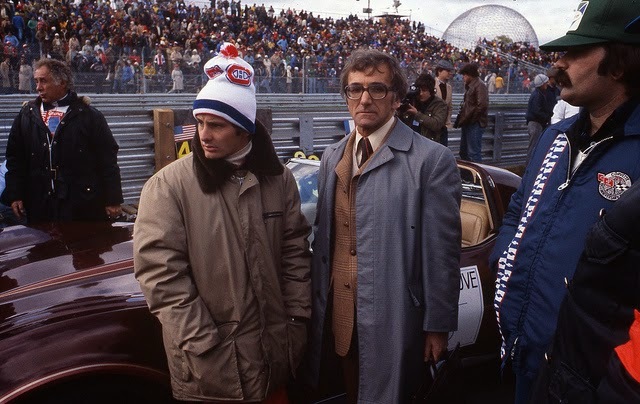 A few weeks after his death, the race course in Montreal was renamed Circuit Gilles Villeneuve after him. 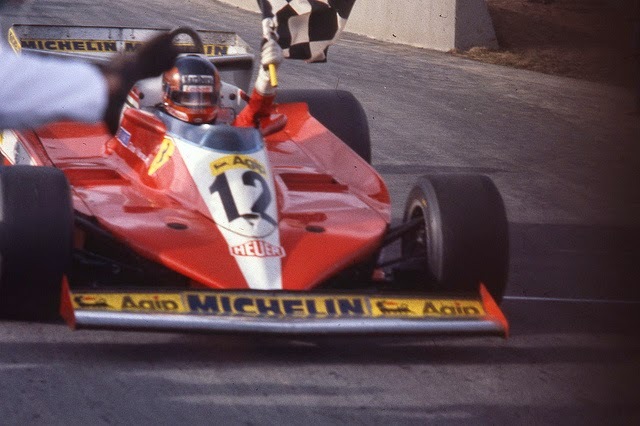 And so far Gilles Villeneuve, is the only Canadian winner of the Formula One Canadian Grand Prix.